Lucas Premium 012 Car Battery, 12v 45ah Battery, Free Delivery. In our huge range of Lucas car batteries we have the Lucas Premium LP012 car battery that has been made with calcium technology which means an increased service life and higher performance. The LP012 car battery is maintenance free and comes with a 3 year warranty. 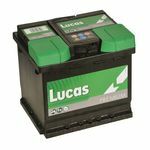 Please check the terminal layout and physical size of the Lucas Premium LP012 car battery against your old battery before ordering but if you’re not sure of these, please contact customer services on 0845 459 3084. Fast delivery and very well packaged would recommend. Not only was this battery the cheapest I could find online, Lucas is a better brand than the lesser known brands some suppliers are selling at a slightly higher price, hence it is very good value for money. The delivery was fast and the packing was very secure and had been done very thoroughly to prevent any transit damage. All round excellent service!